Looking for deals in Vancouver? Located in the financial district of Vancouver city center, Trump International Hotel & Tower Vancouver is located walking distance from shopping, fine dining, and entertainment. The bed was very comfortable, great lightning & cleaning service. Quiet room with plenty of facilities. Featuring two on-site restaurants and a bar, this locally-owned boutique hotel offers a complimentary breakfast with items such as omelets, bacon and sausage. Free WiFi is provided in all guest rooms.... We had such a wonderful experience during our stay. The room was great, with heated floors, robes and bottled water daily. We had room service and it was excellent, as was the cooked to order breakfast. What was best by far was the customer service-it was really top notch. Would stay there again. Located within 656 feet of Waterfront Center Mall Vancouver and Vancouver Lookout at Harbor Center, EXchange Hotel Vancouver features rooms with air conditioning. Free WiFi is available. Great customer service and friendly staff. The room was clean, modern and very comfortable. Excellent location so you are a short walk from restaurants and shopping areas. Located in Vancouver, JW Marriott Parq Vancouver offers dining at 8 diverse restaurants and lounges and on-site spa. Free WiFi is available. A spacious conference space is available. Beautiful rooms down to the linens and sumptuous bath. Lovely dinner and came home to a special treat thanks to Service Agent Sabrina Chen as it was our anniversary. A very nice touch! Will not hesitate to recommend this hotel or stay again. Across the street from the Vancouver Art Gallery, this hotel is a 5-minute walk from the Robson Street Shopping District. It offers an indoor saltwater lap pool, a spa and 24-hour room service. A really comfortable room ... loved the stand alone bath and bath salts !! Located in the Vancouver city center, Auberge Vancouver Hotel features an indoor pool and a sauna. Free WiFi, a refrigerator, and a microwave are provided in all rooms. Gastown is 2625 ft away. Central location. Close to great eating places. This hotel in central Vancouver is a convenient 5 minutes’ walk from Robson Street shopping area. A restaurant is located on site serving breakfast, lunch, and dinner. Free WiFi is available. Super location, loved the underground parking, the breakfast, staff and property were excellent. Featuring an indoor pool and hot tub, this Vancouver city center hotel is a short walk from business and entertainment neighborhoods, Robson Street shops and Yaletown restaurants. Very clean, fresh room. Beds were really comfy. An indoor pool and sun deck are featured at the Holiday Inn Vancouver-Center Broadway, 7 minutes from Vancouver city center and 7.5 mi from the Vancouver International Airport. Free WiFi is offered. Perfect location to downtown in a reasonable price. You can even see the water from your deck. Located in Vancouver city center, this hotel offers an on-site restaurant and bar. A flat-screen cable TV is offered in each room. Vancouver City Center Skytrain station is 5 minutes’ walk away. I cannot rate this hotel highly enough. This Vancouver city center hotel features an outdoor heated lap pool and hot tub. 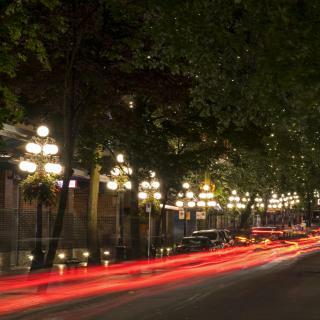 Located at the crossroads of Yaletown and Robson, it is 1640 feet from Queen Elizabeth Theater. Location was great and the rooms were beautiful! Featuring an on-site bar and restaurant, this heritage hotel is located in Vancouver city center on Robson Street, only 0.9 mi from Stanley Park. Clean, great service and value for your money. This hotel is adjacent to BC Place Stadium and Rogers Arena. An on-site launderette is featured. A refrigerator is included in all rooms. Stadium-Chinatown Skytrain station is 984 ft away. Excellent Staff and very clean ! This historic hotel is a 5 minute walk from Vancouver's Gastown district. A Healthy Start continental breakfast served each morning. The charming hotel offers period antiques and free WiFi. Excellent room, comfy bed. I loved the deep tub in our bathroom!! 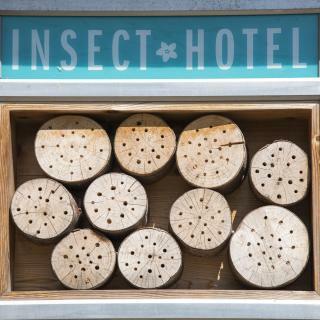 It was the perfect hotel for us. Featuring 2 restaurants and 2 bars, this Vancouver hotel offers a 24-hour front desk and guest rooms with Free WiFi and North America-wide long distance calling. We enjoyed the hotel.. It was clean, staff was great the location was excellent. Free Wi-Fi is available at this Aboriginal themed Vancouver hotel. Each guest room comes equipped with a fridge. Rogers Arena and BC Place are both within a 10-minute walk of the property. Loved the concept and think there should be more places like this across Canada! Featuring an outdoor lounge and on-site coffee shop, this hotel in downtown Vancouver is 3 blocks from the Robson Street shopping area. The hotel offers free WiFi and free Brodie cruiser bike rentals.... The Burrard had a retro feel as soon as you approached the property, and inside it just got better. Featuring an on-site restaurant and lounge, The Sylvia Hotel is located on Vancouver's English Bay with views of the ocean. Robson Street shopping district is 0.9 mi away. Free WiFi is provided. We loved the location which was easy getting to all the places we wanted to go. Located in Vancouver city center in the Sheraton Wall Center, Embarc Vancouver by Diamond Resorts features on-site restaurants and bar. Free WiFi is available. Incredible views. Clean, well-appointed rooms. Exceptionally nice staff. Featuring a gourmet restaurant serving breakfast, lunch and dinner, this Vancouver all-suite hotel offers high-speed WiFi and floor-to-ceiling windows. Excellent. Modern and comftarble. Short walk to Gastown. The DOUGLAS, Autograph Collection is located in the downtown district in Vancouver, 984 feet from BC Place Stadium. Dining is available at one of the 8 diverse restaurants and lounges. The room was really clean, stylish and comfortable and the staff were fantastic. Which hotels in Vancouver have nice views? 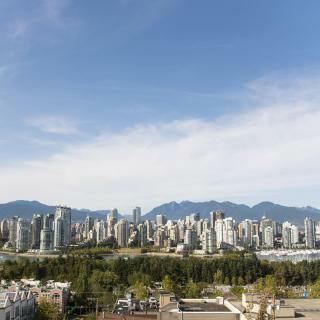 Embarc Vancouver by Diamond Resorts, Pan Pacific Vancouver Hotel, and Fairmont Waterfront got great room view-related reviews from travelers in Vancouver. How much is a hotel in Vancouver for this weekend? The average price per night for a 3-star hotel in Vancouver this weekend is $362 or, for a 4-star hotel, $468. Looking for something even fancier? 5-star hotels in Vancouver for this weekend cost around $618 per night, on average (based on Booking.com prices). What are the best hotels in Vancouver near Vancouver Airport? Travelers who stayed in Vancouver near Vancouver Airport (YVR) have said good things about Fairmont Vancouver Airport In-Terminal Hotel, Pacific Gateway Hotel at Vancouver Airport, and The Westin Wall Centre Vancouver Airport. How much does it cost to stay in a hotel in Vancouver? On average, 3-star hotels in Vancouver cost $105 per night, and 4-star hotels in Vancouver are $177 per night. If you're looking for something really special, a 5-star hotel in Vancouver can be found for $240 per night, on average (based on Booking.com prices). Which neighborhood is the best one to stay at in Vancouver? Yaletown, West End, and Davie Village are popular with other travelers visiting Vancouver. How much is a hotel in Vancouver for tonight? On average, it costs $146 per night to book a 3-star hotel in Vancouver for tonight. You'll pay around $213 if you choose to stay in a 4-star hotel tonight, while a 5-star hotel in Vancouver will cost around $272, on average (based on Booking.com prices). Which hotels in Vancouver are good for families? Many families visiting Vancouver loved staying at the DOUGLAS, Autograph Collection, Loden Vancouver, and L'Hermitage Hotel. Which hotels in Vancouver offer an especially good breakfast? For hotels in Vancouver that serve highly-rated breakfasts, try L'Hermitage Hotel, Fairmont Waterfront, and JW Marriott Parq Vancouver. Which hotels in Vancouver are good for couples? These hotels in Vancouver are highly rated by couples: Rosewood Hotel Georgia, L'Hermitage Hotel, and Loden Vancouver. What are the best hotels in Vancouver near Punjabi Market? Some of the best hotels in Vancouver near Punjabi Market include New Urban Modern Main St. Coach House, Sophia Suite and Alex House in South Cambie. Which hotels are the best ones to stay at in Vancouver? Trump International Hotel & Tower Vancouver, The St. Regis Hotel, and Pan Pacific Vancouver Hotel are some of the popular hotels in Vancouver. Vancouver is an outdoorsy city ranking among the world’s most livable, sheltered by Vancouver Island and the Pacific Range mountains. 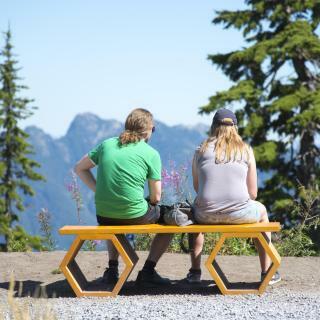 The most famous peak, Grouse Mountain, is a favorite spot for hiking and skiing. Take the cable car up for magnificent views of the city's skyscrapers and huge Stanley Park. Skirting this park is the Seawall, a popular biking trail with paths passing the Vancouver Aquarium, picnic spots and a pitch and putt course. There are also a couple of beaches, but the best ones are along English Bay in Kitsilano. Granville Island is just across False Creek from Yaletown and houses some quirky shops and markets. Ferries depart from here to near BC Place Stadium and home field of the city’s football and soccer teams. The legendary Vancouver Canucks ice hockey team play next door at Rogers Arena. With the largest Chinatown in North America, Gastown is the oldest part of Vancouver and is near the Canada Place cruise ship terminal. We could go on and on about British Columbia's biggest city, but we could never do it justice, so why not try it for yourself? 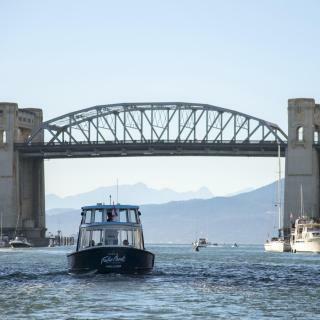 Booking.com has a fabulous range of accommodations, from hotels near Vancouver Airport in Richmond to downtown B&Bs and motels near all of its ferry ports. I quite like visiting Vancouver. I quite like visiting Vancouver. It’s not too hard to get around - on foot, bike or transit, that is. Lots of friendly locals offering help to a gal with a map in hand! So much to see and do...and eat 😊 Bring an umbrella of course. Vancouver was an exciting city with lots to see and do for everyone. I traveled with husband and 2 teenagers and did the Hop on Hop off bus with tours to Capilano Suspension Bridge and Grouse Mountain. Both of these attractions well worth a visit. The city was clean and easy to navigate. We love Vancouver. Being raised in Southeast Alaska and living in the Seattle area, Vancouver feels very familiar in a variety of ways, while also having its own unique flavor. We love the museums, especially Science World, and spent an entire day at Granville Island. On Granville, the Granville Brewing Company restaurant is wonderful. The people are so friendly and their poutine is our favorite. If you want something a little stronger than beer, Liberty distillery is outstanding. Don’t forget to walk through the Market and check out all the vendors. There is also a little store with dog treats/supplies that we love. They make their own treats with natural ingredients and our dog loves them. Our son spent most of his time at the Kids Market, playing in their jungle gym and at the arcade. I can’t say enough about Granville Island. My biggest tip is to go on a weekday and get there early so you aren’t circling for hours looking for parking. The parks are also wonderful, although the weather didn’t cooperate with us so we could fully enjoy them. This is a great place for people with kids. We ate at a Ramen restaurant across the street from our hotel called Horin Ramen & Sake that I would highly recommend. Another must is AJs Brooklyn Pizza. Some of the best pizza we’ve had. The one negative I have is that it isn’t the easiest city to drive. There are very few intersections with green arrows or designated turning lanes, so if you want to turn left you’re probably going to wait through at least two or three cycles of the lights. Also, the lanes are much smaller than I’m used to in the US. The next time we come I think we will check out the public transportation options. I can’t wait to go back. There is a large population of street homelessness and feels unsafe at times. Stayed together as a family and even the Odeon Cineplex felt like a gathering place of homeless community. I totally know people need a place to hang out and rest, it just had its own vibe. The highlight of our trip was experiencing THE DARK TABLE! Highly recommend this dining event!! 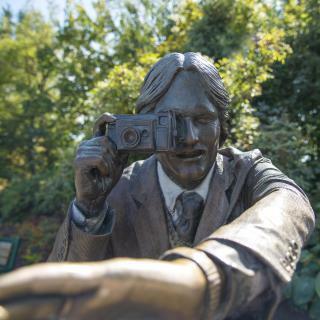 Things to do are scattered all over in Vancouver. 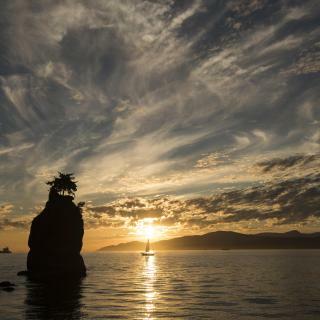 Things to do are scattered all over in Vancouver. Given that it rains frequently, there is a lack of things to do inside, down town. Pretty sights are at the waterfront and Robson street is fun for shopping. Also great places to eat in Vancouver. Do not recommend walking from Chinatown back to the waterfront: was SHOCKED by the large amount of addicts and homeless people on the streets in that part of town. A huge issue that the local government should deal with in a more appropriate way. It is very close to the city center. We walked 1 mile to canada place; there are buses if you dont want to walk. Shops and restaurants are around the hotel. Price is good since vancouver is expensive. Olivia (front desk) is very sweet and helpful. It is very quiet since our room is located in the back part of the hotel. Our room is next to the restroom so its very convenient. Restrooms are always clean( rooms doesn’t have it’s own restroom). I was travelling with my 2 kids and this hotel is perfect for us. We stayed here for 3 nights. The hotel was clean and facilities were good. Great location right next to the bc arena the home of Vancouver whitecaps soccer team, bc lions American football and concert venue. Short walk to gas town where there are good pubs and restaurants and again to the city centre. There is a great sports bar attached to the hotel which shows all ranges of sports, food and drinks. Location is great on Robson Street right next to Coras for breakfast and close to Downtown Vancouver.The deluxe room was spacious and comfortable,with a good size fridge. Air con was loud but effective and you quickly get used to the loudness. Staff were very friendly. A great hotel, not at all posh but great value for money. The location of the hotel is unbeatable in downtown Vancouver. Steps away from shops, restaurants and bars. Also only a short walk to both stadiums. Room had a fridge and microwave and beds were extra comfy. Staff is very friendly and helpful when needed. Super friendly and yet professional attitude of all the staff at Wedgwood. Very helpful fir all my inquiries. Water, cookies and chocolates every night Bacchus restaurant ... one of the best restaurants in Vancouver inside the hotel. The hotel is situated right in the middle of downtown Vancouver, so it's easy to reach every place you need. The room was very clean. We enjoyed the breakfast so much because it's abundant and really good. Beautiful views. Well appointed furnishings and decorations. Cost equivalent to two hotel rooms in local Holiday Inn. Great landlord. Excellent location to explore all of downtown Vancouver. Great location in Vancouver, walking distance from metro, downtown, gastown and shopping area. Hotel room was clean and spacious, every day new towels. Hotel staff, great customer service and hospitality. Perfect location in Vancouver downtown. The rooms are spacious and very clean. Perfect location for seeing the best of vancouver. Staff were very friendly and helpful. Hotel and rooms were clean. The hotel was well located on Robson street in downtown Vancouver, giving easy access to things we wanted to see. Clean hotel and located within easy reach of downtown Vancouver via hotel shuttle (return via public transport). The hotel has a great location, pretty close to the Stanley park and downtown Vancouver. Clean and neat inside. We loved the location which was easy getting to all the places we wanted to go. The best breakfasts which we really enjoyed. Our room was very comfortable and the bed was perfect firmness for us. All the staff of the hotel were friendly and very helpful when asked questions about the area. We loved the history of the hotel. Found it to be a very romantic place to stay. Amazing location, big, very comfortable room, very nice and clean bathroom, coffee machine and water boiler in the room, balcony and spectacular view. Amazing value for money.